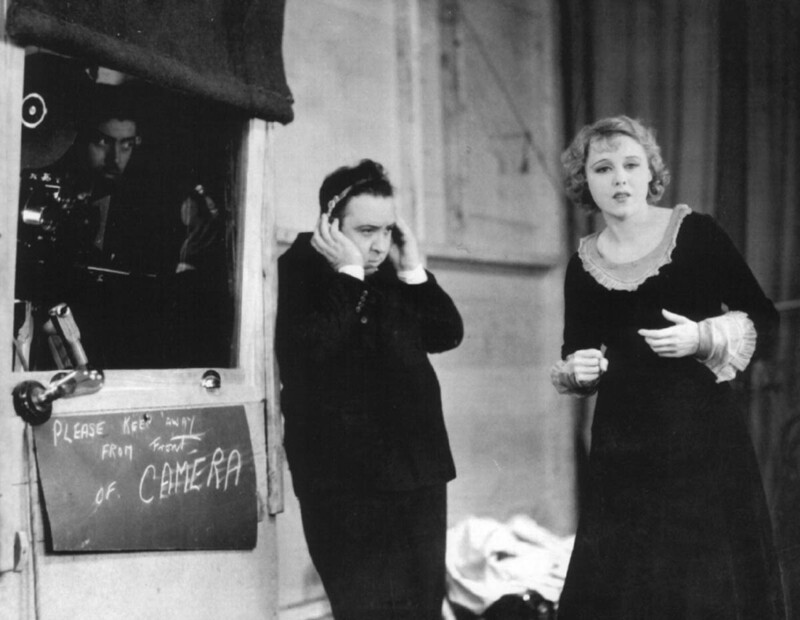 Hitch slips on a pair of headphones to direct Anny Ondra on the set of his first sound film, Blackmail (1929). From the beginning, he exploited the audio track's Expressionistic potential. The war hero crushes the leading lady against his chest as rain gently falls on her creamy, blemish-free cheeks. They kiss. Suddenly, from out of nowhere, a 100-piece orchestra swoops in to deliver an orgasmic crescendo. That's non-diegetic music for you. Always wandering in, squelching the realism of a movie scene. You can see, though, why film makers love it. Such music helps cue the audience how to feel about or react to a scene. It's an easy way to manipulate an audience's emotions—if that's all you want it to do. But what if you want a deeper level of engagement that moves your audience to participate in the movie more actively? In that case, non-diegetic musical underscoring could be a barrier to such intimacy. Alfred Hitchcock understood that naturally occurring sounds are more suited to putting an audience inside the film—that is, to putting them through a “pure film” experience. Interestingly, three of Hitchcock's films whose settings were restricted to a single location—Lifeboat (1944), Rope (1948) and Rear Window (1954)—restrict the use of non-diegetic music to the opening and closing credits. The rest of the time, the only music you hear comes from within the movie. In the 1944 movie, Joe Spencer's (Canada Lee's) penny whistle helps relieve the tedium of being lost at sea. Other characters take turns singing as well. Hitch also takes godlike control over the weather to provide a naturalistic soundtrack. These organic sounds make it easy to forget that they do double duty on behalf of both the setting and the the story. Thus, while the seeming intent of that solo music is to boost the spirits of the castaways (as well as the audience), it ironically draw attention to just how isolated the tiny crew is on that vast ocean. Likewise, the sea and wind sounds provide a textured, nuanced point and counterpoint to the travails of the castaways. For instance, the sea waves are temporarily hushed as the castaways pause in mournful silence to honor the watery burial of Mrs. Higgins' (Heather Angel's) baby. Later, though, as capitalist shipping tycoon Charles Rittenhouse (Henry Hull) prepares to beat socialist John Kovac (John Hodiak) at a round of poker, the Atlantic wind heads off this unfair monetary trickle-up with a gust that blows their makeshift cards away. The irony is so strong that “Ritt” blames Kovac for what you can really call an act of God. I take this scene to mean that, though the strong may prevail over the weak in this life, there is a greater justice at work that levels all humans. (Of course, that is the implicit theme of the entire movie: the group of characters in the lifeboat are a microcosm of society.) But it all happens so naturally that you can simultaneously laugh at the irony, wince at Ritt's loss (which he can well afford), and rejoice at Kovac's escape from financial ruin without feeling artificially forced to perceive a “moral” to the incident. Or you can just watch the movie and let the weather effects pull you deeper into the setting. Anticipating the musicless killing of Gromek in Torn Curtain, the beating to death of Willy in Lifeboat is rendered more realistic by the absence of music. The brutality of the characters who set upon the German like a "pack of dogs," as Hitch described them, is brought into relief by the absence of music. The sea and wind are as passive as the camera itself, which stands at a discreet distance from the violence. In this regard, part of the beauty of Hitch's films is that they let viewers choose between finding a deeper meaning or simply enjoying them for entertainment. To Hitch (and for me, as a Hitchcock Geek), both ways of looking at his movies are acceptable. Though some critics, notably Andre Bazin, call Hitch to task for the tyranny of his camera that only allows for one set of perceptions, his themes allow for a variety of conflicting interpretations. That multiplicity was misunderstood in 1944 when the supposed propaganda film Lifeboat was scorned for sympathizing with the Axis powers. Such is the two-edged nature of Hitchcockian “pure film,” which brings life in all of its rich contradiction to the screen. Brandon and Phillip's isolation from society in Rope is accented by their swank apartment with its lofty Manhattan view displayed through a large window that resembles the framework of a gilded birdcage or hothouse. Brandon and Phillip are far above “the madding crowd” and when their apartment windows are shut, the silence emphasizes their social disconnection. Helen Cox and David Neumeyer note in their essay “The Musical Function of Sound in Three Films by Alfred Hitchcock” that noises from the street below are heard three times: following David's murder; after Brandon's obnoxious defense of murder as an art for the privileged few; and at the end of the film. Like air hissing out of an escape valve, street noise is used to release tension from these scenes. In the final case, Rupert opens the window, fires the gun into the air and for about two minutes we sit with him, Brandon and Phillip in a wordless funk as the latter plinks his final notes at the piano over the distant hum of traffic and voices and approaching sirens, which drift upward and curl about the room. For Brandon and Phillip, that cathartic burst of fresh air also carries the scent of their own impending death as murderers. Rear Window is one of the greatest masterpieces of audio design in all film. Not only is all the sound diegetic (except for a musical overture that bookends the movie), but it all seems to waft in through L. B. Jefferies' (James Stewart's) apartment apartment window, keeping audiences rooted in his point of view. 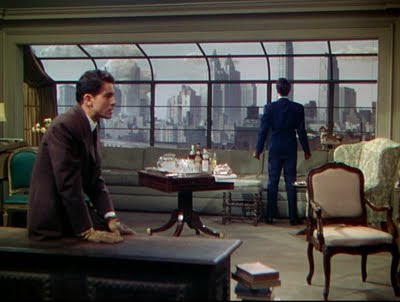 With most of Hitch's films you can turn off the sound and follow only the imagery. 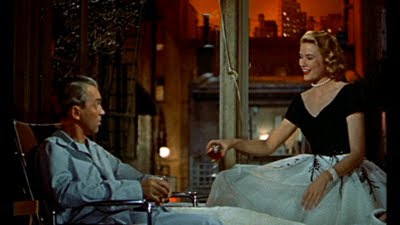 With Rear Window, however, you can turn off the picture and the main dialogue and still get a strong sense of mood. Yet, like the weather in Lifeboat, that ambient noise serves a further purpose. Hitchcock wasn't just a realist. His background in German cinema made him a lifelong Expressionist. Those commonplace neighborhood sounds—distant conversations, the tinkling laughter of a house party, Greenwich Village traffic, a yapping dog—reflect off the walls of L. B. Jefferies' courtyard community, echoing his own state of mind. If the scenes he witnesses in his window are a projection of his own inner state, these noises are its soundtrack. When Jeff overhears the bitter sniping that takes place between Mr. and Mrs. Thorwald, or the wife's nagging “Ha-a-a-a-rry” from the newlyweds' apartment, it echoes his own fears about commitment and marriage. Early in the film, the afternoon's drowsy white noise of neighborhood life aurally approximates Jeff's own slumber as he takes a break from peeping on his neighbors. Though he may feel omnipotent, with a front-row view into his neighbors' apartments, he isn't God. And so later, while sleeping, he misses seeing a crucial detail: Mr. Thorwald leaving his apartment with a mysterious woman who is not his wife. This beautiful panning shot is scored to the anodyne sound of steady rain and the ghostly call of a distant foghorn. It is as though Jeff, whose suspicions have been aroused by Thorwald's late night trips, has subconsciously willed his neighbor into the role of murderer. The point is, in a Hitchcock film, incidental sounds aren't just part of the fabric of realism. They aren't just part of the story, they are the story, another implement in Hitch's “pure film” toolkit. Hitch achieved that mastery by the most honorable means possible: he paid his dues. In the 1920s, he cut his directorial teeth using mostly stationary cameras to create soundless films shot in grainy, low-resolution black and white. With those basic materials, he was able to move audiences like few directors then or since. As time went on, he accepted each technological advancement—sound, improved film stock, color, 3-D, Vistavision—with a contradictory sort of eager bemusement. Understanding the value of such “enhancements,” he also comprehended their limitations and often longed for those innocent days of the silent era, when you had to no choice but to work in “pure film.” Embedded in his tissues was the knowledge that the essential capability of film, its magic, lies, not in this or that technological capability, but in its very nature: that it can flow through a projector and create a sense of reality on an otherwise blank screen. As the world's foremost practitioner of pure cinema, he knew when to cut away and when to leave his audience alone in the dark. He knew there was a time to speak and time to keep quiet, passive as a camera, taking it all in. Thanks for another interesting post. One thing left out of the "Lisa" story is that the middle-age woman who is prevented from committing suicide by the song appears to be united with the composer at the end. Only after he frustrates her suicide is he able to complete his mission so to speak--perhaps also ending in marriage? There also seems another reason why Kelly's character's name and the song are both called Lisa. In the opening scene with Grace Kelly turning on three lights to her name Lisa, Carol, Freemont, she ends the lighting up process sporting a Mona Lisa smile. At least that is how I would crack Hitchcock's "Lisa" Da Vinci Code in the movie. Thank you for your goldmine of a blog and this analysis, I live in England, and Channel 4 have done a week of Hitchcock's films (Topaz on today). Hi Lausace! Hitch was, indeed, very interested in what the ladies in his films wore. Often, he could be very controlling about wardrobe (Just ask Kim Novak re Vertigo). In general, the same was true for Kelly. However, in her case it would seem that his exacting tastes happened to match hers, so there was little or no conflict.